Deborah A. Imondi, chair of the Legislative Committee, and Patrick Deady, President of the Rhode Island Mortgage Bankers Association. 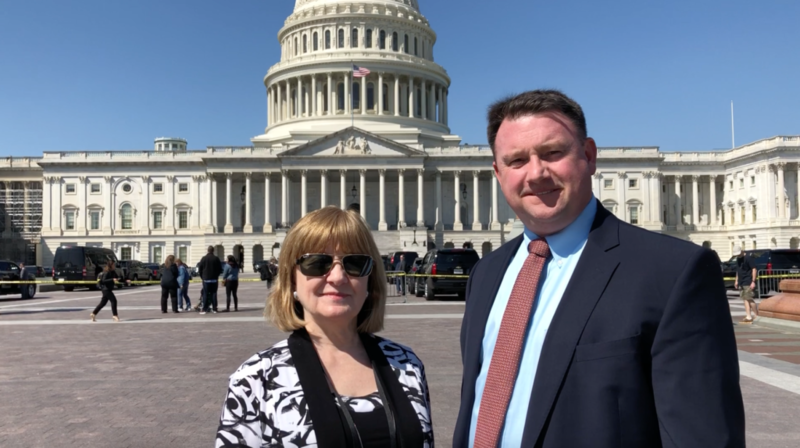 PROVIDENCE, R.I. (April 11, 2019) — Mortgage and banking lenders from Rhode Island descended upon Capitol Hill as part of the 2019 National Advocacy Conference. During the two-day event, Patrick Deady, President of the Rhode Island Mortgage Bankers Association (RIMBA), met with Sen. Jack Reed and staff from Rhode Island’s congressional delegation to advocate on behalf of consumers and mortgage professionals in Rhode Island. “A stable real estate economy is essential to maintaining the country’s growth. As the U.S. Senate hears housing finance reform proposals, Rhode Island Mortgage Bankers Association joins other mortgage industry leaders in supporting plans that foster robust competition, fair pricing for lenders of all sizes, and access to affordable credit for borrowers,” Deady said. Deady, who is also the Senior Vice President and Director of Residential and Consumer Lending at Bank Five, was joined by Deborah A. Imondi, a former President of RIMBA and chair of the Legislative Committee. “We are here advocating on behalf of the real estate financing community and the consumers they serve to ensure that proposed legislation and policies promote the Rhode Island real estate climate in a positive way,” Imondi said. The conference was held days after the White House called for an end to the conservatorship of Fannie Mae and Freddie Mac. Reducing the government’s involvement in the housing market could be fraught with issues if proposed policies are not carefully analyzed, Deady added. Members of National Mortgage Bankers Association attended the conference between April 2-3, following a conference for state mortgage association leaders on April 1st. The Rhode Island Mortgage Bankers Association is dedicated to promoting and sustaining responsible home lending in Rhode Island. The mortgage association has over 90 corporate members, which represent thousands of mortgage lenders throughout the state who help businesses and people secure mortgages. As part of its overarching plan to create a better housing market, RIMBA regularly promotes educational initiatives, addresses legislative challenges, and strives to cultivate membership growth.